It's a great time to stock up on fishing tackle and accessories before the big snapper arrive in August to fatten up for spawning. 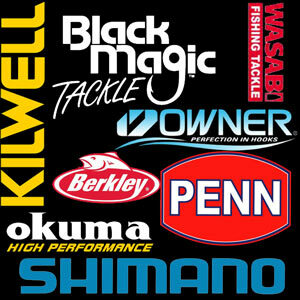 The Sale Includes Top Brands of Quality fishing gear - Over 200 items on sale now. Many items are at or below cost. A few weeks ago we got our first shipment of 6/0 Target Snapper Hooks in and tested them against 5/0 Target Snapper Hooks. We set two lines in 50 metres of water over spongy foul bottom, both sets had two floating beads on each trace and were baited with octopus bait we had caught on a previous trip. TIP: We have found that octopus is a fantastic snapper bait and often target them by slow drifting big baits on the bottom when they are in the channels, if you catch one slice the head below the eyes to kill it and put it in the ice slurry with the rest of your fish. Fresh frozen octopus is the best of all the frozen bait types. Always freeze the octopus ASAP and skin before using. Leave the suckers on. One medium octopus will bait four 25 hook longlines. All Double Floating Bead Traces 50% Off! 4/0, 5/0, 6/0 and 7/0. After dozens of boat longline sets comparing floating bead traces with normal traces the results are conclusive. Floating bead traces catch more big fish! Baits also last much longer as they are not easily attacked by snails, crabs, sea lice or starfish. The 4/0 and 5/0 hooks are on 22kg traces - 6/0 and 7/0 hooks are on 31kg traces. 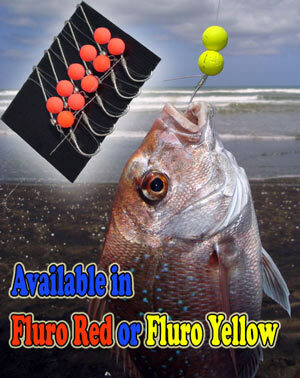 All sizes include Two Floating Beads, In-line Longline Clip, and are snelled on Target Snapper Hooks. The bigger sizes are great for big fish areas like the West Coast, Northland and South of Tauranga on the East Coast. Limit 25 Floating Traces Per Customer (5 Packs). Hurry Stocks are Limited at These Prices! In the video above we fished a ShoreThing Kontiki from Uretiti Beach during the time the red sack weed was prevalent. The masses of drifting weed had no effect on our fishing success on either of the two days we fished. The ShoreThing turns your Kontiki into a Dropper Rig and has many advantages. Check out the full information and instructional videos on the ShoreThing Kontiki Fishing System here.